Totally cool to have a nine-year-old kid on my “I wish I could ride as well as _____” list, right? From this zoomed-out perspective from the stands at the Dublin Horse Show, you’d be forgiven for thinking you’re watching the jump-off from a grand prix: this combination is just blazing around the ring, leaping each fence with style and class, speedy and fast but not out of control or unbalanced. 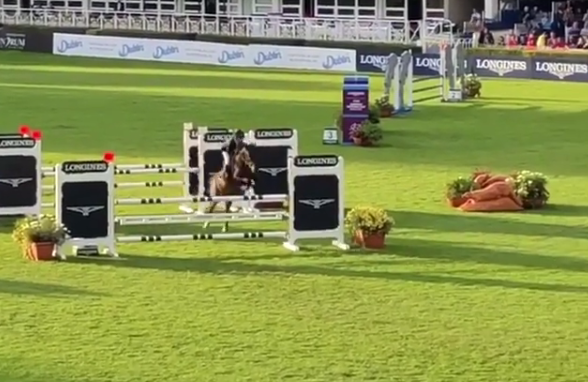 Surprise: this is nine-year-old Senan Reape and 18-year-old pony Mickybo, a ten-year veteran of the Dublin Horse Show — and this is the jump-off round for the 128cm national championship. Finishing a full two and a half seconds ahead of the competition, it’s safe to say that Reape and Mickybo turned and burned. Listen to the roar of the crowd! According to competition rules, riders of the 12.2 and shorter ponies must be no older than 12. These fences are in the 3’6″ – 3’9″ range. We’ll just casually mention that one Bertram Allen, international show jumping superstar, won this class at the age of 11 at the Dublin Horse Show. If his phenomenal rise to the highest levels is any indicator, we should be keeping our eyes on young Senan here.